We operate 13 acres in three separate locations. Our operation first applied for Organic Certification in 2014 and have practiced sustainable farming practices ever since. We grow only produce. We have no livestock. It is a family operation. According to ATTRA, the percentage of each food dollar that is received by the farmer has been declining for a century. In 2017 a farmer earned only $.17 of every food dollar. A farmer earned 190% more in 1980($.33). Most of the food dollar goes to marketing, processing, and distribution. Past SARE grants have explored value-added products as a way for farmers to earn more of that food dollar. This proposal addresses value-added processing, which adds safety risks and numerous hurdles for the farmer such as traceability, labeling, procurement of equipment, and marketing. Pat & Rachel’s Gardens LLC, in cooperation with Fresh Farm HQ Cooperative Association (FFHQ), proposes to identify simple-to-process, high-demand, fruit and vegetable products and test them in three markets: farmer’s markets, grocery stores, and institutional buyers. Pat & Rachel’s Gardens is a certified organic producer and processing facility dedicated to sustainable agricultural practices. The facility is a “sub hub” for FFHQ, where product from ten members is aggregated. As a group of farmers, we are dedicated to finding ways to increase profitability by providing a venue for farmers to process excess crops, extend their selling season, and make quality, locally-grown produce available year round. Can you describe your farming operation for me? Can you tell me what motivates you to practice farming? What obstacles have made success difficult? What kinds of things frustrate you about farming? What things about farming are most positive? What experience do you have with preserving your produce and selling items made from your produce (e.g. jams, jerky, baked goods)? What ideas have you considered for preserving and selling such a “value-added” product? What crops do you commonly have a glut or surplus of which must be discarded or given away? Can you describe your experience as a farmer-member of Fresh Farm HQ? Can you describe the aspects of Fresh Farm HQ that are most positive? Can you describe the aspects of Fresh Farm HQ that frustrate you or could be improved? How might Fresh Farm HQ help you more? I recorded the interviews by taking notes and asking follow up questions when the response was unclear. Answers to the first eight questions were recorded with the name of the respondent. Answers to the last four questions were recorded without identifying the speaker to encourage frankness since these were often critical of the cooperative. Anonymity protected those being criticized and those speaking their opinion. After the interviews were completed, the notes were examined and themes or key ideas were looked for that would help us in the second phase of our research into value-added processing. The results of the last four questions were typed to be shared with the Board of Directors and the Administrators of the Cooperative as a way to improve our business. When writing this grant we set forth five ways we should measure benefits from this experiment with value-added processing. First we would keep careful records of the cost of production to see if the added labor and capital would make a good investment for the purpose of value-added processing is to return more of the food dollar to the farmer. Second and third, we would measure the shelf life extension as well as the local appeal of these products to the customer. Fourth, we should measure increased sales and lastly illustrate with examples of success how value-added processing can benefit the farmer by reducing waste and preserving produce until a later time when that product could bring a higher price. Finally, we hoped to identify obstacles and opportunities for future success. The chart below shows the labor cost in minutes per unit (usually per bag) required for processing. We did notice that our processing became more efficient with practice. We found ways to streamline the processing. As one may see, the highest cost was the freezing of green beans. 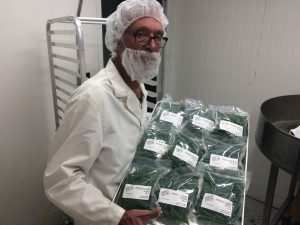 When all the processing was taken into account–the cleaning, culling, blanching, cooling, weighing, bagging, labelling and freezing–it cost us nearly one quarter of an hour per one pound bag. At $12 per hour this would add $3 per bag to the cost. Maybe this would be worth the labor investment if the farmer were selling at retail price at a farmers’ market or to a CSA, but it could never be sold wholesale and compete with the grocers’ other suppliers. 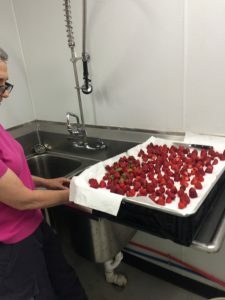 Strawberries, while they don’t require the steps of blanching and cooling, do need to be handled individually if the farmer desires individually frozen berries. They also need to have their stems cut off. We placed ours individually on cookie sheets so they didn’t touch one another. Using $12 per hour labor, the labor to process strawberries added $1.69 per 10 ounce bag for processing. We sold ours easily for $5.50 per bag at market. We also sold them wholesale to a local grocery. Our strawberries picked on Monday would not last until Saturday, so we considered this as a way of preserving fresh berries until they could be sold frozen at a high price rather than let them spoil. 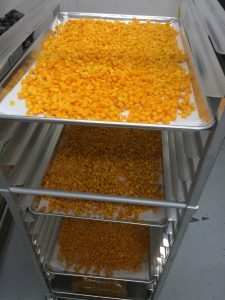 Diced butternut squash, when bagged in 10 ounce bags cost about seven minutes of labor or $1.40 per bag @ $12 per hour. Use your own wage figures to calculate your cost per bag. We sold them wholesale and recouped our labor, but when sold at market, we really saw their value. Many buyers liked the idea of having ready to cook squash rather than having to peel, deseed, and throw away 20%. Fresh, diced butternut squash took the least amount of labor (it was packed in five pound bags for the schools). Our schools preferred the fresh squash and made it cost effective. 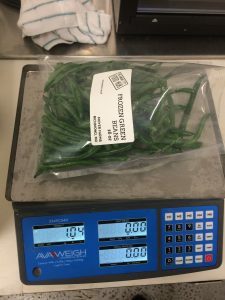 Except for green beans, we believe the experiment proved that in terms of labor cost, value-added processing did provide us with a good return on our investment. Shelf life was obviously increased. Our research indicated that frozen vegetables keep easily for a year (and some studies claim three to five times that long if they are vacuum sealed before freezing). The only indicator of aesthetic appeal was the repeat orders we are having from the local grocery and the anecdotal experiences from our market customers. We know that the frozen food section of most grocery stores is one of the largest sections of each store. Customers are used to buying frozen fruits and vegetables. I don’t know how many times a customer would sigh and exclaim that fresh broccoli they bought didn’t last because they didn’t get around to cooking it right away. The fact sheet below gives examples of successes we had during this year of experimentation. We are increasing our production of value-added products this coming year because our our positive experience. 2018-SARE-Grant-FACT-SHEET-for-Annual-Mtg-KCFoodHub1 The fact that one can sell a pint jar of pickled okra or dill pickles for $6.00 at market is encouraging. Sales increases were most noticeable at our fall and winter markets and at the pop-up markets sponsored by our cooperative, the KC Food Hub. All winter long 25 to 35 % of sales was from value-added products. One week the KC Food Hub sold $16,000 in product and $5,500 of that was value-added product. Obstacles to success are really opportunities for success in our mind. What do customers want? We know that salsas are one of the biggest sellers, but we didn’t even try that this year. We have fresh herbs that are market returns. Why not dehydrate them and sell the dried herbs later? The expense of equipment and the hassle of obtaining a licensed kitchen are obstacles, but we bought a like-new Hobart FP 150 continuous feed food processor for $950. It can chop as fast as you can feed it. We did discover that many churches have licensed kitchens which are seldom used and can be rented for canning and processing. The cost of electricity for running a freezer must be factored into the overall cost of production. School markets may seem an obstacle but are really an opportunity. Many food service directors want fresh, locally-grown produce. The schools want product during the times when most farmers are not growing much, and they are out of session when crops are abundant. They will buy storage crops such as potatoes, onions, sweet potatoes, and winter squash. They will buy value-added product if you show them how it fits with their needs. Obstacles are opportunities waiting for you to find a solution. We used several methods to do our market research to find easy-to-process, high-demand products that would bring more cents of the food dollar back to the farmer. Because we were already connected to the ten farmers in our cooperative, we thought we would formally interview all our farmers to ask their ideas. We also had connections with farmers’ markets, grocers, restaurants, corporate, and institutional buyers because of the network developed by our cooperative’s food hub (Kansas City Food Hub hereafter referred to as KCFH). In the farmer interviews we first asked what experiences each had with preserving food and making value-added products. We also asked what products they often had trouble selling or had a surplus of which might be preserved and sold at a later time. I grouped the interviewed farmers’ ideas into frozen , canned, dehydrated, baked, pressed (oils), and ground (flour). Canned goods included prepared sauces, jams and jellies, herb butters, salad dressings, and pickled vegetables. One farmer suggested offering products for juicing. Another suggested supplying pet food manufacturers. Most had first-hand experience preserving fruits and vegetables for their own use. One farmer who had worked in Niger had assisted its people in preserving food for themselves as well as their livestock where they extracted oils, made jerky, peanut butter, gum Arabic and sesame cakes. 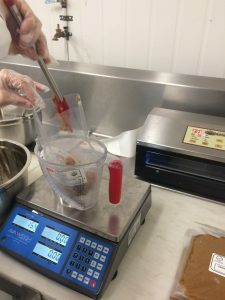 Another of our farmers who has eight years in commercial food processing, has had excellent success incorporating a variety of processed foods into her sales. She has produced jams, jellies, and syrups; relishes, salsas and pickles; dehydrated tomatoes, cucumbers, zucchini, kale and herbs; baked pies and breads; sold frozen vegetable juices and even made flour from sweet potato pulp. We found a wealth of experience and resources among our farmer coop members. In designing the grant, we set a goal of selecting five vegetables and two fruits for processing this year. One of the motives we had for making value-added products was to add value to products which might, for various reasons, go to waste and bring no value to its producer. Two of our chosen value-added products, one fruit and one vegetable, were processed for this reason—strawberries and green beans. Strawberries: Strawberries picked for market must be picked at prime ripeness for best flavor. This, however, limits their shelf life. We worried that those picked on Monday would not last until Saturday market, so we froze them individually, sealed them, and kept them for future. We actually ended up selling them at the market and to one of our grocery stores. Strawberries culled and washed and prepped for freezing. Market buyers paid a premium price for them and were happy to get them for smoothies and baking. The grocer was anxious to add locally-grown frozen fruit to her offerings. One of our coop members sent more strawberries than we could find customers for. They were not going to last long, so we froze those too. These went to the grocer. 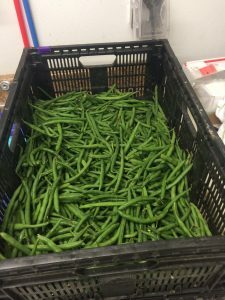 Green Beans: Another coop member who picks green beans with a machine, had a surplus. Alicia, our wonderful sales manager, asked us to preserve them for a winter CSA. We blanched and froze the green beans in one pound bags. Not tomatoes: Though we predicted that tomatoes would be one of the most versatile crops to process this year, we were surprised that there were few tomato surpluses. Last year they were so plentiful that some of our growers left them on the vine without picking them. The auction house was only paying $4 per box! This year that surplus didn’t exist (maybe they cut back production based on last year’s experience). We were prepared to make sauces and salsa from the surplus. One farmer taught us an important secret about slipping the tomato skins in boiling water–whole tomatoes can be frozen and later thawed slowly by sprinkling them with water which accomplishes the same result, skinless tomatoes. This knowledge effectively eliminates the step of heating them in the hot summer. We did freeze some green tomatoes whole and then chopped them after the frost. We also pickled some green cherry tomatoes, but we didn’t count these for the purposes of the grant. We do know from our discussions with farmers and observation of markets that salsas and sauces will be pursued as value-added products next year. Blackberries: The second fruit we processed was blackberries. These were individually frozen on trays. Quite simple to do, and they come out of the freezer like little marbles–separately frozen and easy to portion out what is needed. During a lull in farming activity, we used the frozen blackberries to make blackberry jam. We did this with sour cherries too. Butternut Squash: Though butternut squash and sweet potatoes can be stored without processing, we found these were high-demand products when diced or turned into puree and frozen. 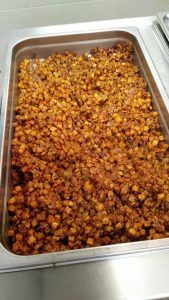 One of our neighboring school districts, Gardner-Edgerton, wanted butternut squash freshly diced, not frozen. 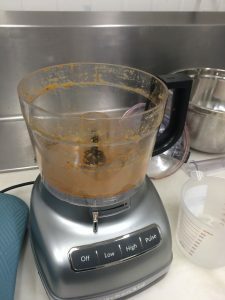 Their nutritionist created a “Cinnamon Roasted Butternut Squash” recipe (see the link below) so that each of their ten schools could prepare the food. The standardized recipe including nutritional data can be found by selecting the link below. Many customers at the farmers’ market valued having the frozen, diced product because it saved them the time of peeling, cutting, and deseeding them. It provided us with another product to sell in our winter market. Value-added products supplemented our winter sales greatly. In hindsight, we wish we had kept some frozen strawberries for the winter market, but we sold all we had in two weeks during the summer. Sweet Potatoes: Sweet potatoes did not dice as well as the butternut squash. The cubes split or fractured creating many very small pieces which were hard to bake without the little pieces burning, so we took the advice of a chef friend and baked them in bigger pieces before running them through the food processor to make sweet potato puree. 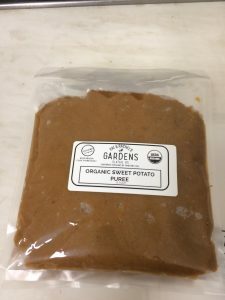 The advantage here was the raw pureed sweet potato could be used in a variety of recipes. No sweet potato had to be tossed because it was ugly or too little or too big. We turned our sweet potato seconds into frozen puree. Cucumbers and Okra: Cucumbers and Okra didn’t always sell at the market, but they continued to produce, so we canned pickles and pickled okra. When I tasted our first pickled okra, I told Catherine, my farm manager, that they couldn’t be better. I was wrong. She pickled some with chilis which were out of this world! We sold them during market and during winter market. The pickled okra sold out quickly. The pickles, were also a hit. Nearly 30% of our winter sales were value-added products. Next year we will have more to sell. We set a goal of two fruits and five vegetables for value-added processing. 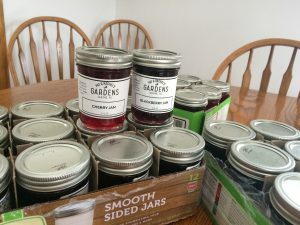 Blackberries, strawberries, cherries, cucumbers, green beans, okra, butternut squash, and sweet potatoes (which makes three fruits and five vegetables) were turned into value-added products which were in high demand and sold quite well. Not only did they bring in income we wouldn’t have had, but they also allowed us to use products we couldn’t have sold fresh. Value-added products made sense economically. 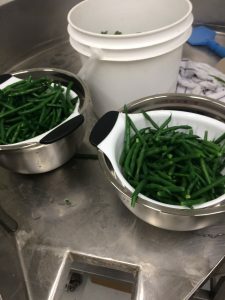 The extra labor needed for freezing green beans, picking, washing, blanching, cooling, drying, weighing, packaging and freezing taught us that frozen green beans are not as economically profitable as the others. 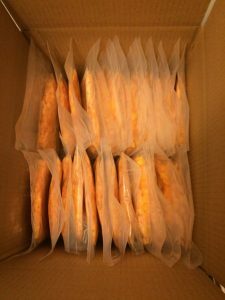 Frozen scones: Though we didn’t set out to bake goods, we stumbled across a fact we didn’t know. Baked scones are frozen before they are baked to add a flaky texture to the finished product. 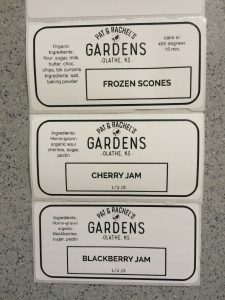 We experimented with this so that during our winter market we could sell both freshly baked scones and a four-pack of frozen, unbaked scones for our customers to take home and bake whenever they desired them. Though they didn’t fly off the table, we sold quite a few and found a secondary advantage. We could make them ahead of time, freeze them, and bake a dozen or so the morning of the market to sell as fresh. We found recipes for sweet scones with bits of our fruit in them as well as savory scones flavored with our herbs (e.g. basil and tomato scones). Food safety is important to keep our customers healthy, our products’ quality high, our markets open, and our reputation trustworthy. As part of this grant, we participated in food safety training presented by Londa Nwadike, a food safety specialist for both University of Missouri and Kansas State University. Since we live in Kansas near the Kansas/Missouri border and sell in both states, we needed to know food safety regulations from both states. We also attended an all-day FSMA (the USDA’s Food, Safety, Modernization Act) training as part of our GAP certification process. We were inspected twice as part of that process. Every part of the food production process must be carefully observed for possible contamination that could lead to food-borne illness. Though the regulations are rigorous, the health of our customers and ourselves and the integrity of our products require it. Readers of this report should follow the food safety regulations for their country, state, and locality. Meat and poultry are regulated in the United States by the USDA, each state, and local governmental entities. All other foods in the United States are regulated by the FDA, states, and local governmental entities. It is beyond the scope of this report to explain the rules and regulations we follow, but an example will provide a glimpse into the complexity of it. It is easier to follow Kansas regulation because they are the same statewide, however in Missouri regulations may vary by county and from city to city. If we decided to sell baked goods in KS we don’t need a license, but if we freeze the dough to sell so our buyers can bake it themselves, we do need a license. If we sell fresh baked goods in Missouri we additionally need to add “not inspected” to the label though no license is necessary. Frozen dough requires a license in Missouri. Each county and city may have additional regulations in Missouri. The most revolutionary concept we learned at our FSMA training had to do with immersing our product in water to wash it after it was harvested. We learned that water is a very good transmitter of pathogens from one piece of produce to another. For example, if one piece of lettuce is contaminated, when you immerse several lettuces in water together, you may have contaminated them all. 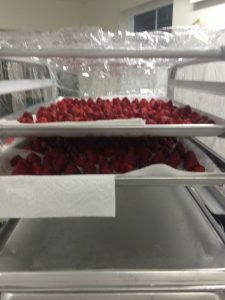 For this reason immersion as a cleaning process requires several steps that one-pass rinsing does not (in rinsing, water is sprayed on the produce and the pathogens are washed away without infecting the rest). Immersion requires a sanitizer be added to the water. The sanitizer does not kill the pathogen, it only surrounds it so it can’t infect other produce. The sanitizer must be maintained at a certain level or it becomes ineffective. The pH of the water also must be monitored because the pH can decrease the effectiveness of the sanitizer. Two other things must be monitored, the temperature of the water and the turbidity of the water. It has been found that if the water and produce temperatures are too different, infusion can occur where the water is drawn into the produce thus potentially drawing in pathogens. Turbidity (the build up of organic matter in the wash water) must also be monitored so that the wash water doesn’t become too cloudy. After learning more about the biology and physics of immersion washing, we avoid immersion when possible and use rinsing instead. More detailed information can be found in Cornell University’s Produce Safety Alliance Grower Training(section 5-2, pt 2, “Postharvest Water”). Adding processing steps necessitates understanding the added safety risks they might introduce. This is why many states require additional licensing for processing food. Once the five vegetables–green beans, butternut squash, sweet potatoes, cucumbers, and okra–and two fruits (actually three–strawberries, blackberries, and cherries) were selected, we needed to establish a Standard Operating Procedure (SOP) for each finished product that incorporated the food safety and quality standards spoken of above. Each SOP provided us with a standardized process which employees could follow. Our previous experience processing diced sweet potatoes, turnips, beets, and greens aided us in this process. The consultants at Kansas State University linked us to valuable resources such as the University of Georgia’s website (https://nchfp.uga.edu) which serves as a reference site for food preservation. I attach the SOP’s we developed for frozen strawberries, frozen green beans, and fresh, diced butternut squash as examples. N.B. Organic produce cannot be co-mingled with conventional. Choose only best berries without discoloration or molding spots. Berries should be at optimum ripeness for best flavor. Wash berries by spraying them in a mesh colander (do not immerse). Hull green top with paring knife. Let berries dry on parchment paper placed on baking sheet in a single layer. Place baking sheet in freezer for one hour or more. 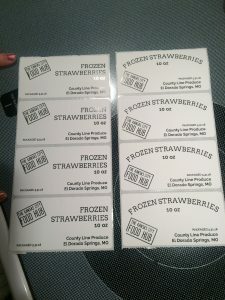 While strawberries are freezing, attach waterproof labels on freezer bags before filling bags. After one hour in freezer, weigh the appropriate amount and place in pre-labeled freezer bags. Evacuate air before sealing (either manually before zip locking or with vacuum sealer). Pack bags flat in boxes before returning to freezer. Wash beans by spraying them in a mesh colander (do not immerse). Remove any debris stuck to the bean. Snap off stem and tip (tip is optional). Break into smaller pieces or leave whole. Blanch beans for 3 minutes in boiling water. Immediately cool beans in ice water for three minutes. Let drip dry for a few minutes. 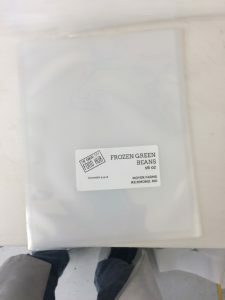 Attach waterproof labels on freezer bags before filling bags. Weigh the appropriate amount and place in pre-labeled freezer bags. Place labeled bags on each baking sheet until sheet is covered (one layer deep). Place baking sheet in freezer. Label boxes that will be used to store frozen product. After an hour or two in the freezer, pack bags flat into labeled boxes. Seconds can be used as well as firsts when freezing butternut squash. 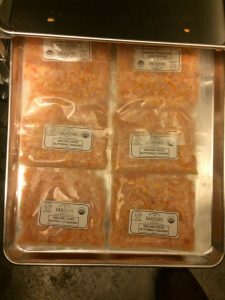 Attach waterproof labels on freezer bags before filling. Wash by scrubbing outside with brush while spraying them in a mesh colander (do not immerse). Peel outside rind using potato peeler. Split in half with knife. Remove seeds and any discolored or soft spots from the squash. Run through the Hobart Dicer with the 10mm slicer and 10mm dicing blades installed. Place labeled bags on each baking sheet one layer deep. After an hour or two in the freezer, pack bags flat into labeled boxes and return to freezer. Before we began processing, we did our research to find high quality, affordable equipment to process these choices. 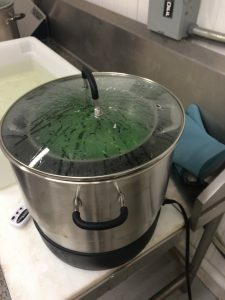 Since our farm is all-electric and depends upon our solar array for half or more of its energy needs, we selected two Ball FreshTech Electric Water Bath Canners to fulfill the need for blanching vegetables and canning them. 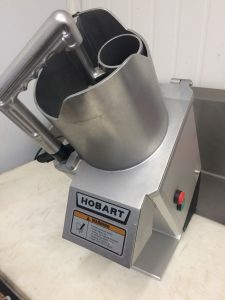 Our Urshel RA-A dicer was bigger than we needed and prohibitive in price for most farmers, so we settled on the Hobart FP 150, commercial food processor to do our slicing and dicing. We purchased the 3/8” (10mm) slicing blade and dicing grid. It can dice 300 to 600 lbs per hour if needed. Our research showed that vacuum sealing frozen vegetables increases their shelf life (up to five times by some studies) by removing most of the air from the bag. 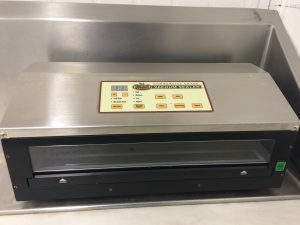 Our pick (which we later regretted because it failed out of the box to remove air from the bags, and we could never get support from its manufacturer) was the Harvest Keeper Commercial Grade Vacuum Sealer. 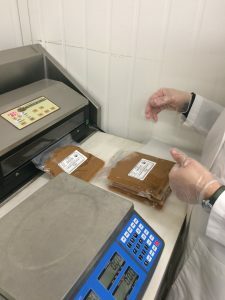 We did finally discover that we made a mistake because we had ordered vacuum sealer bags designed for internal vacuum sealing machines–ones which the item and its bag are placed inside the vacuum chamber rather than outside it. The Harvest Keeper and most smaller machines place the item in a bag sitting outside the machine. These bags have ridges that allow the air to be sucked out of the bag. 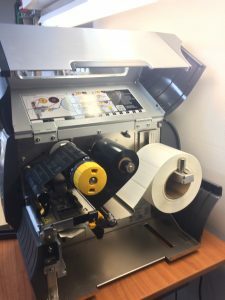 It took us quite a long time to understand the variety of thermal printers available and which one fit our needs. Our experience with processing and selling frozen product told us that we needed waterproof labels that would withstand moisture and a wide range of temperature. There are inexpensive thermal printers (like the ones that print register receipts at the grocery store). These will work if your needs are not permanent labels (since the paper is light sensitive and “prints” or turns black when heat is applied, the entire paper label darkens to grey or black over time). The more expensive printers heat-transfer a ribbon of material for a permanent label (these printers are called thermal-transfer printers). 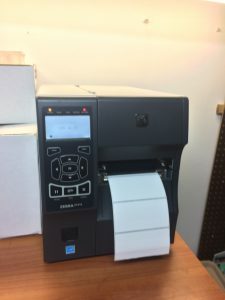 We picked a thermal transfer printer, the Zebra ZT 410 with 203 dbi print head. If I had it to do over again, I would have picked the 300 dpi print head for less pixilation when using really small type. We also selected a polypropylene label not a paper label for its waterproof and freeze proof qualities. This device allowed us to create and print labels for all our processed products. Though we had a walk-in commercial freezer, we understood most farmers wouldn’t, so we added a Frigidaire 19.8 chest freezer. Our desire was to make this research practical for as many as possible. I really valued our thermal transfer printer because the labels were cheaper to make than the former method of printing to a sheet of ten waterproof labels. Our marketing of product was successful at the Farmers’ Markets where we able to gauge interest and measure increase in sales. The frozen product as well as the pickled items and the frozen and baked scones lifted our sales 30%. We didn’t really have a large quantity to sell this year and will increase for next year. We also had excellent success marketing to a well-established local grocery. Our frozen diced butternut sold out last year and continues to sell each month this year. They don’t have any other locally-grown frozen product for sale. 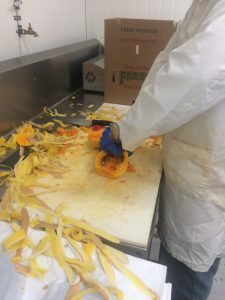 Our marketing to KC Foodhub clients was not very robust except for the 350 pounds of fresh butternut squash the KC Foodhub sold to the Gardner-Edgerton Schools. 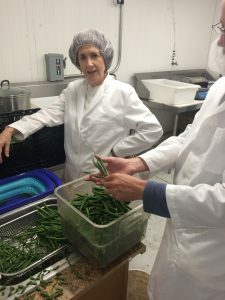 The frozen green beans we produced for the KC Foodhub are still in the freezer and will be part of their CSA offering. I might point out that that 350 pounds was one menu item sold and consumed in one day. The potential is great for local farmers to supply local schools. Part of the reason the marketing was not as robust as we hoped, was due to the fact that a KC Foodhub director was let go and continuity suffered because of it. The KC Food hub did sponsor three pop-up markets with its corporate clients where 33% of the items sold were value-added products. It is clear that many people are interested in buying processed local foods. 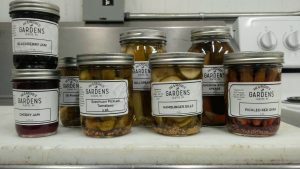 Both the Pat & Rachels Gardens and the KC Food Hub websites, www.patandrachelsgardens.com and www.thekcfoodhub.com shared the our research and experience. Two stories will provide good examples of the value we found in processing and preserving highly perishable products. County Line sent the KC Food Hub 8 cases of strawberries more than we had customers for. They were ripe and needed to be picked. Alicia suggested we freeze them at the height of their ripeness. We froze them in 10 oz bags and later sold them to a local grocery store. Without the processing, they would have had to be composted. After we harvested the organic butternut squash, we cured them and then sorted them. 200 pounds of them had blemishes which would have prevented their storage over the winter. We skinned, de-seeded, chopped and froze them in 10 oz bags and sold them throughout the winter to a local grocery store and to our winter market customers who didn’t want the trouble of skinning and dicing the squash themselves. These apparently worthless squash turned a good profit for us.